OMG Posters! » Archive "Exit 11" Art Print by John Cebollero - OMG Posters! My wife is going to love this one in the living room! Didn’t this guy show up at an Alex Pardee signing? 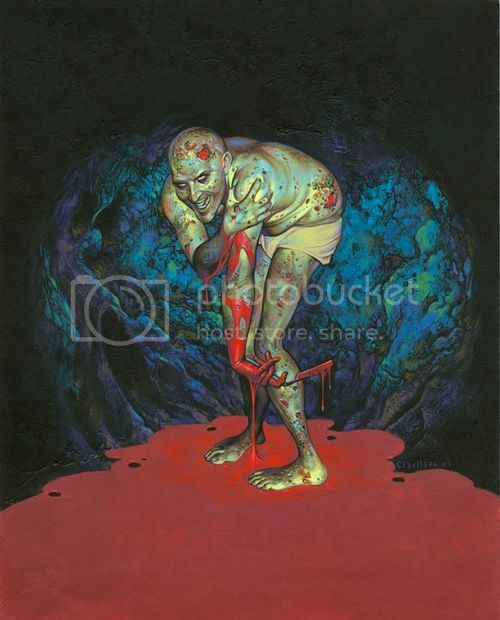 But doesnt the underwear look surprisingly clean for a guy living in a cave in a pool of blood? I took some better photos of this print so you can see how good they came out. This picture reminds me of the vampires in Blade part two. Gives me the creeps but it’s a awesome piece of work.